The Republic day of India commenced from 26 January, 1950 signifies the transition of India from a British dominion to a Republic and in the present days is considered as a national holiday. The day also signifies the adoption of the Constitution of India. It is regarded in the present days as one of the three national holidays in India. It is also the day when the entire country realized the dream of Mahatma Gandhi and the numerous freedom fighters who, fought for and sacrificed their lives for the Independence of their country. To mark the importance of the occasion the Republic Day is celebrated with a lot of enthusiasm all over the country and especially in the capital New Delhi, where the celebrations are initiated with the Presidential to the nation. But this is also followed by the solemn reminder of the role and sacrifice of the martyrs who died for the sake of the country in the freedom movement and also in the succeeding wars for the defense of sovereignty of their country. 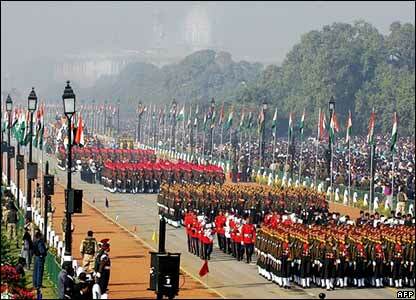 In addition, a grand parade is held in all the state capitals along with the capital to commemorate the incident. The different regiments of the Army, the Navy and the Air force participate in the march past in all their finery and official decorations at best. There are also displays representing the different states of the country. The poignant exhibits are found becoming emblem of the activities of the people of the very state along with the efficient presentation of music and songs. It is found that each display brings out with it the multiplicity and richness of the culture of India and the whole show lends a festive air to the occasion. At the same time the patriotic fervor of the people on this day is specially felt and brings the whole country together even in her indispensable miscellany. From the Kashmir in the north to Tamil Nadu in the south, Maharashtra to Manipur, each and every part of the country is represented in occasion. It makes the people proud of their country and also reminds them of the conviction of the slained martyrs in the battlefields of the freedom struggle and wars.